-1 acre of trees produces enough oxygen for 18 people every day. -Planting trees remains one of the most cost-effective means of drawing excess CO2 from the atmosphere. -3 trees planted strategically around a house can reduce energy use by up to 50%. -Trees add beauty, increase property values, and reduce stress. -1 tree planted by every family would reduce 1 billion pounds of CO2 annually from our atmosphere. 1. Call your local nursery to get a list of trees that grow best in your area; then determine the type of tree you would like to plant. -Dig a hole at least twice the size of the root ball of the tree. -Place several inches of good soil mix at the bottom of the hole before inserting the tree. –Place the tree in the hole. If your tree comes in a plastic pot, burlap, or wire basket, remove it from the container without disturbing the root system. -Fill the hole with good soil and pack firmly. -Anchor your tree using a tree stake. Use wire and a length of old hose to secure tree to the stake – the hose will keep the wire from cutting through the trunk. Remove the anchor after two years. -Water thoroughly and fertilize as directed. 3. Give a tree to someone as a gift. Our first spring in our new house, we planted a tree in our front yard. I had always wanted a flowering crab ap ple tree and so that is what we chose. 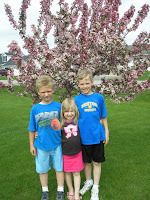 Every spring we take the kids picture in front of it to show the trees growth as well as theirs. The previous home owners had planted 2 huge Red Maple trees that now provide us with homes for Robin’s nests, shade on the hottest days, and beautiful fall color with leaf piles to jump in in the fall. Trees improve our air quality, save energy, reduce pollutants, provide homes for wildlife, and add brilliant colors to landscapes. So, go get your shovel and plant one today!